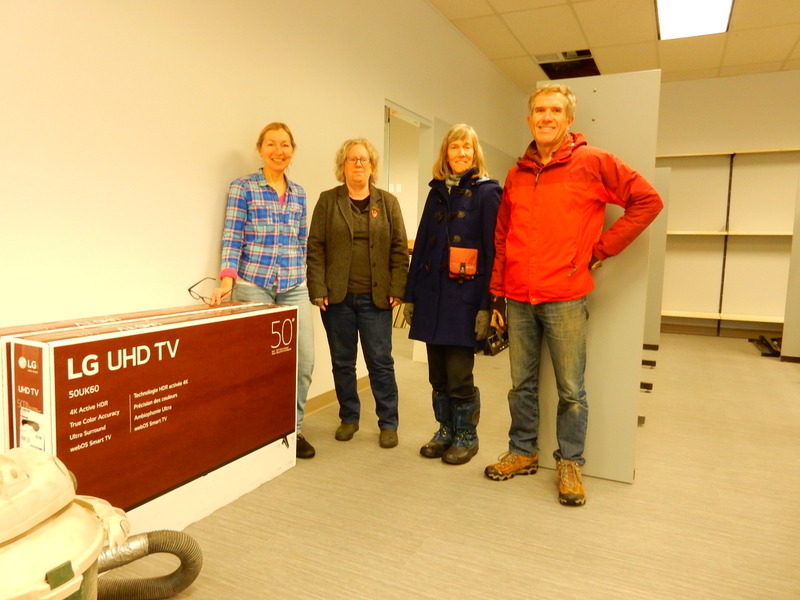 Working to get the Library ready: pictured here, left to right, Gillian, Beverley, Ann and Bob. Rossland Public Library will re-open on December 11, according to library director Beverley Rintoul. Before that, the building will open briefly just to host “Santa” during the Rekindle the Spirit of Christmas celebration on December 1. In the week preceding the opening date of December 11, book-lovers who “fostered” library books during the renovations can take them back to the library. The larger meeting room will also be equipped with its own tables and chairs, so that users no longer have to haul chairs from the rest of the library to have a place to sit. The new flooring is interesting: tiles that look like linoleum underneath, but with a velvety carpet nap on the wear surface. Library volunteers and staff were busy hauling new items in for installation. “Setting the opening date has lit a fire under us,” Rintoul commented. Not only were there no books on shelves, there were no shelves installed yet. The check-out computers were not in place; some ductwork and wiring still needed to be done; but the new set-up is taking shape. Book-lovers and other library users are eagerly awaiting the re-opening – “I’ve read all those books I took home,” lamented one avid reader who fostered nearly a hundred books during the closure.